Turkey is perhaps one of the most intriguing countries I’ve ever visited, and Istanbul is its rocking capital city with a swag all its own. A secular country and modern to boot, women are not obligated to cover their hair although the majority of the population is Muslim. Some choose too, but it’s generally not common specially among the younger generations. So, before expanding further I have to say that it would be impossible to encompass all that Istanbul, once Constantinople, the first capital of the Holy Roman Empire has to offer. I mean, You need a few months to explore it, and that is more than most people have, including me. I was there for 5 days and will try my self to describe what I saw in a series of posts. This post was inspired by a photo I took of the Galata Tower from the district of Sultanhamet before hopping into a cab to go to Istiklal Cadessi which is a happening avenue with stunning architecture, dozens of bars, shops and nightclubs that leads to the Taksim district. It’s hard to describe the ambiance, I’ll throw try my best to use the right words. First I’d say, hip and cool because that’s the feeling you get. Young Turks are modern, extremely sophisticated and good looking people. The contrast of Istanbul’s vibrant youth and the ancient surroundings offer a magical juxtaposition. Another thing that I noticed is that people love to eat in this town, and going out at night involves just as much food as it does beer and the Anise-flavored Raki, Turkey’s alcoholic beverage of choice, and some say the national beverage. Now as far as the best places to visit, there are so many options, but it really depends what you’re in the mood for. Istanbul is known as much for the casual pub-style bars to jam packed nightclubs with some of the top DJ’s in the world. Reina for example has been a staple entertainment complex for years and caters to celebrities, tourists, and mainly a high end crowd. 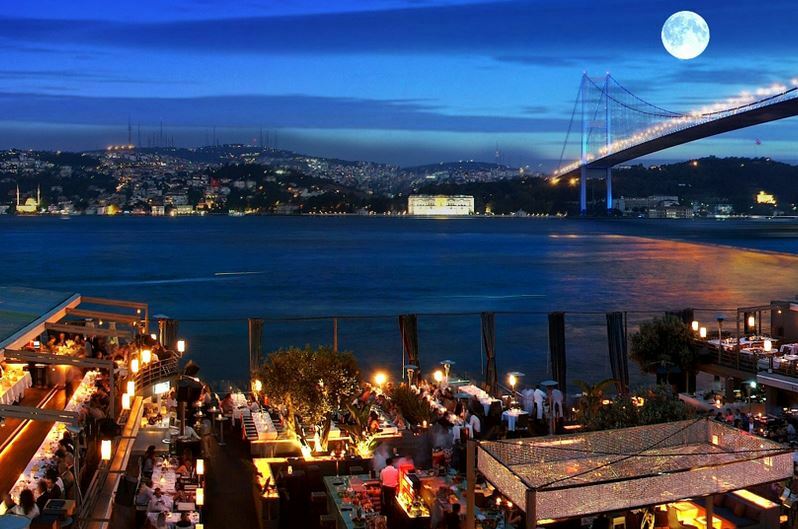 It has three restaurants and some of the best Bosphorus views in town. Reina is located at Muallim Naci Caddesi No.44, Ortaköy. You NEED reservations because this place is always packed, call (0212) 259 59 21, or have your hotel book your reservation and probably also a car cause you’re going to have fun. A view of Reina nightclub and restaurant in Istanbul from the top deck. A short walk from Taksim square you’ll find Kassette. It’s off on a side street away from the bustle of Istiklal street but you can’t miss it, there’s a dance party every night with DJ’s playing primarily house music, and patrons dancing even on the outside on the streets, and in true Ottoman fashion, pillows are laid out along the side of the club’s alley, so people can relax and take a break from all that dancing. The club is beautiful and centrally located making it a much loved venue among college students, and all people young and restless. Balkon Bar is another top-rated Istanbul hangout that’s renown for it’s rooftop patio. The place is decorated with cute Christmas lights and just has an all around awesome vibe. Balkon offers a variety of goodies that are great for sharing such as pizza’s, pastas, and salads, deserts, and a full bar. To get there from Taksim Square (favorite reference), pass the Russian Consulate on İstiklal Caddesi (street) and make a right onto Asmalı Mescit street. A left onto Sofyalı Sokak and a right onto Şehbender Sokak and you’re there. Speaking of rooftop bars, if you visit during the spring or summer months, a great time to visit by the way, you’ll notice that Turkish people love their rooftop bars. You”ll find them everywhere, and hopefully, even in your own hotel. Or you can be proactive and check hotel amenities online and book a hotel that has one. I did, and spent a lot of time having a blast experiencing the spectacular view it offered. I won’t even bother describing it, its impossible. There’s a feeling you get upon seeing that lovely city sprawled before your very eyes so openly, yet so full of ancient mysteries. A bridge between Europe and Asia and furthermore, the very cradle of tremendous civilizations. The Turkish language is hard to grasp, but it sounds like a blend of Arab and European. Although in some areas in Turkey they speak Arabic or regional dialects including the candid Karamanli dialect which borrows heavily from Greek. On somewhat of a side note, something interesting for me was visiting Athens immediately after spending a week in Istanbul. The combined trip made sense because the cities are not that far from one another so you might as well. Now, I’ll try to explain this as best as I can. Greece was occupied by the Ottomans for almost 300 years and that has obviously influenced their culture. However, I keenly felt the contrast between East and West upon landing in Athens. I suppose the best way to say it- is you can just sense the connection Greece has to Western culture. It’s hard to imagine Turkey before the Ottomans, and there’s no doubt they brought a lot to the proverbial table of culture and wisdom, but it is perhaps due to their conquering of what was then the city of Constantinople in 1453 that propelled them into becoming the huge force that conquered half of the known world. If you want a balanced blend of history, outrageously delicious food, and a culture that is known for their hospitality and sassy banter, then book your ticket now. You’ll never regret it. Istanbul is on my Bucket List … so someday I will visit. Have a blast! Best wishes to you and thank you for stopping by. Thanks … gotta get there first … and I foresee it happening by cruise ship.